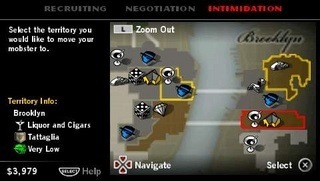 This PSP port of EA's free-roaming gangster title removes... the free roaming. So, is EA ready to make me an offer I can't refuse? They've already attempted to do so with the console versions of The Godfather, a game based upon the 1972 classic film of the same name. It follows in the same structure of Grand Theft Auto, in which you have to complete several tasks around old New York in order to push yourself up the gangster ladder. The game was alright, nothing spectacular but not a complete failure either. 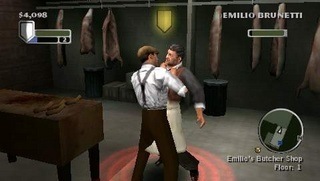 And it's certainly better than what's arrived on the PSP in the form of The Godfather: Mob Wars. This game feels so disjointed it's almost like being set up in a marriage to Corleone's uglier daughter- and you don't even get to meet her until the day of the ceremony. Oy vey. Anyway, in the game, you play a new up-and-comer who, as a kid, witnesses the brutal murder of his father. Don Corleone (played digitally by the late Marlon Brando) assures you that the time for revenge will come. Years later, the kid becomes a man and he is enlisted into Corleone's service by his right-hand man, Luca Brasi. Soon you're learning the basics and climbing your way up the ladder to Don-hood...although the climb is anything but easy. What's different about the PSP version of the game is that the free-roaming element has been removed and been replaced with a Mob Wars mode, which isn't too shabby. In this mode, you actually work out strategic card placements as you work against rival families, laying out attack methods and setting items such as bombs to destroy their compounds. However, it feels like the game's incomplete at times, and rather easy to beat. You've basically got the function to try and overtake so many things before they're defeated, and then it's over. If more time had been spent smoothing out the tactics side of this, making it a little bit harder in the process, we would've really gotten somewhere. The game also contains some action sequences, but they're slipshod at best. Instead of letting you free-roam from mission to mission (like you can do in the console games), you instead warp to where you need to be, and can find your target easily and wipe them out. This makes the game a bit too simplified for its own good, although there's further flaws than that. See, the game has a TERRIBLE camera system. I'm talking so bad that you have to readjust after merely going around a corner. A target lock-on system fails to add any luster, and the game runs into constant glitches with characters that can go through walls and floors. Too bad, because the game doesn't look or sound too bad. In fact, it's rather faithful to the theme at hand. Old New York looks pretty damn solid, as do most of the characters in the game. (Don Corleone actually looks like the real thing.) The movie's original theme is present and intact, although it outshines the rest of the music featured in the game. The voicework and sound effects are top notch, sounding just like the real deal in gangster-hood. Enough. What the game has for you in presentation, it can't make up for in lackluster gameplay and big problems. The Godfather: Mob Wars could've used some sufficient clean-up on its journey to store shelves, especially when it came to resolving the horrid camera issues and trying to make the two halves of the game blend in together better. As is, it's just a game that tried too hard for its own good, and ends up sleeping with the fishes. Too bad. What's Hot: Mostly good graphics and sound, aside from glitches; decent tactical gameplay. What's Not: Horrid camera system; the game's action sequences are too easy to beat.